What’s it like to be one of the Jeopardy! clue writers? The game show institution that is Jeopardy! has much more going on behind the scenes than it might appear. Every time you look at that board full of categories and clues, a highly coordinated effort has taken place to make sure everything is just right—including dozens of things you probably never even considered. After all, someone has to make sure that “Who is Harriet Tubman?” isn’t the answer to more than one clue a game, or even more than one clue a week. Billy Wisse is the head writer for Jeopardy! He’s been there a while, because, as he says, there isn’t much turnover on the staff at his game show. And once you learn just what his job consists of, it’s not hard to understand why. Working for Jeopardy! sounds like one of the coolest gigs you could ever hope to land. Read on to find out how the clues get written, what kind of things Alex Trebek vetoes, and what the best question is that you will never, ever see on the show. The A.V. Club: How long have you been working at Jeopardy!? Billy Wisse: I started on Jeopardy! in 1990. I was a researcher and proofreader. Then in 1996 I became a writer, and since 2011 I’ve been the head writer. AVC: Were you a fan of Jeopardy! prior to getting the job? BW: I was a casual fan. I hadn’t watched it that regularly—in fact, I had to frantically watch a few episodes when I was trying to get the researcher job and submitting sample clues. So it was in the background for me, I guess. AVC: Do you remember how long you’d known about the show or how old you were when you first encountered it? BW: Wow. I think maybe I was in high school when I first knew about it? No, I guess it wasn’t even on when I was in high school. I don’t know, I guess… You know, I can’t really answer that. It was always sort of there. AVC: That’s probably how a lot of people feel. What did you go to school for? Did you have a career in mind prior to this? BW: I was an English major, and then I was pursuing a graduate degree in English but I didn’t really know what I wanted to do. And then I moved to Los Angeles to try to become a screenwriter, and that was an ill-advised plan—it didn’t work out—but I answered a blind ad in Variety, and was lucky enough to get that original job in 1990. AVC: What job did you have before applying at Jeopardy!? BW: I did script coverage, I did proofreading and copy editing and I worked in book stores, but nothing that really amounted to a career. AVC: And you said you were made aware of the position through a random ad? BW: Yeah, a blind ad. I was answering ads in the trades, and it didn’t even say what the show was. It just said “researcher needed for TV show” or something like that. AVC: Do you remember what the interview was like? BW: They gave me the contestant test, which has off-and-on been part of the process of hiring a new researcher, to see if you’re familiar with the material. Then I wrote some sample questions even though I wasn’t going up for a writing job. But I had gone to McGill University in Montreal, which the head writer at the time had a very high opinion of—it’s a good school, but he might’ve had a little bit of an inflated idea of the quality of a McGill education. That helped me out, which was lucky for me. AVC: So when you were hired, how did they explain the job to you? BW: What I was doing was the same thing that the researchers do now. You’re presented with a category, but the individual unit is the clue, and each clue has a number of facts in it, and your job—and the writer has provided one source, at least, for every element within the clue—every name, every statement, every date—and your job is to double-source all of those, so you make sure that every word in the clue is solid, and then secondarily, to check to see if the clue is pinned, which is quiz-show speak for making sure that there is only one correct answer or that, if there’s an alternate answer that’s also acceptable, that it’s been anticipated. And that was the researcher job then. Aside from the technology changing, that’s the researcher job now. AVC: And so when you first started, what did a normal workday for you look like? BW: You would go to a bin that had categories in it, a physical bin, and the categories were six clues—because there are five in a category and there’s always an extra—and they were typed on index cards, and each index card had the category title, the clue, and the response, and the writer’s sources, and you would take that card and sign off on the sources provided, and then write in with a number two pencil the other sources you had found, make any changes that you thought were necessary, and then you would try to do three or four of those categories in a day. At some point you’d either turn them in to get typed into the one computer we had at the time, or if they needed changes, you would take them to the head writer and go over them with him, and make sure all the changes got made. And that was the job. AVC: How big was the staff when you started? BW: Wow. When I started there were five writers and five or six researchers. AVC: Okay. So it was pretty much one-to-one writer to researcher? BW: Yeah. And that’s pretty much where we are today except it’s more like eight and eight. AVC: Do you all share an office? What does it look like in your building? BW: There’s a library—in 1990 of course, most of what we did—well, everything—was in books and newspapers, so there was a library. We still have the library. It’s about, I don’t know, 10,000 volumes. Some of them actually go back to the 1960s and ’70s version of the show that was on NBC, so all the offices are around the library. And either people sit in their offices or, back then it was—because everyone had to be using the books, it was more collegial—now everyone kind of sits in their office and is online, and comes out and looks at the books occasionally. There are times when we meet and discuss things, of course, but yeah, it’s a library with a bunch of offices around it. AVC: For those first couple years, what were the hours you worked usually? BW: It’s 9 to 5, and as it is today it’s a 9-to-5 job except on tape days. AVC: So how long were you a researcher prior to switching up? BW: My title was researcher for six years. In there I was also the proofreader. Like I said, at the time we only had one computer in the office, so the material had to be transferred from what the writer had written and the researcher had signed off on, and then it had to be checked to make sure that the typed-in version was accurate. And so I did that—I did the proofreading—and then I also was doing a little copy editing. So that whole—that was six years, 1990 to 1996, and then there was a vacancy. Generally speaking, our writers were formerly researchers. And that was my path. AVC: So when there was just the one computer, when you became proofreader, was it you alone at the computer? BW: No, there was a person whose job it was to type the material into the computer. I can’t remember what her title was. Material coordinator or something. But it was her job to type the material into the computer and change those index cards to what are called strips, which we still call strips, which is a category when it’s ready to be put into a game. And so I would check her work and make sure the strips matched what was originally signed off on, and like I said, do copy editing and double-check the research occasionally. So we basically had a full-time enterer, computer-inputter, I guess. And that job, obviously—well I guess not obviously—but it doesn’t exist anymore because now everyone has access to our database and types their own clues into it. AVC: How long was it until you had more than just the one computer? BW: In the late ’90s we got an Internet computer to do research on. At first there was just one and everyone would have to take a turn on it, and then eventually everyone got one on their desk, and then it was probably in the late ’90s that we switched to having a database that everyone accesses. AVC: Walk me through the process of how a Jeopardy! question gets written. Do you start with a category, or a piece of information? What comes first? BW: Well, you’re always writing categories. That’s the basic unit that you’re doing. There may be times when there’s an existing category that needs a new clue, and you fill in there or something like that, but basically you’re writing categories. A category can originate any number of ways. Sometimes you have one clue, one fact that you happen to have dug out or heard on the radio or something, and you say, “This is great and I have to build a category around it.” Or you might have a great idea for a title of a category and you say, “That’s really cute, now I just have to figure out what the category is going to be.” Or you say, “Hey, time to write a history category, what about the 17th century? Time to write a sports category, how about basketball?” However the idea for the category comes to you, you write seven clues. As the head writer, they give me the category, I eliminate one clue, put the rest in order—one through five, with an extra—do any rewrites, tweaks, whatever I think is necessary. Then it goes to the researchers. I might as well continue on the process while we’re on the subject. BW: So then the researchers research it, turn it into the aforementioned strips when they’ve done all their work and they’ve made any necessary changes and I’ve talked about the changes with them, and then I assemble the categories into games, and at that point the writers have a meeting, which we call a round table, and we go over every aspect: this clue, we did this two weeks ago, we can’t do it again; this clue could be worded better; this could be shorter; why, head writer, did you put the easier clue at the $1,000 and the tougher clue at the $200, you don’t know what you’re doing… there’s a lot of that. Not in those words. AVC: Let me pause here just to clarify. So the structure of the writer’s day is defined basically by coming up with a set number of categories? AVC: Is there a quota, like X number a day? BW: If you write two to three a day—if you do all the multiplication—then that ends up with the 3,000 or so categories we need every year. But tape days are different. Days when we have round table meetings are different. But basically if everyone can come up with between 10 and 15 categories a week, then the numbers work out. AVC: So roughly two to three categories a day, seven questions per category is the norm? AVC: And if a writer comes up with a category they’re excited by, will they sometimes write more questions, because they say, “Oh, this could be more than one day’s worth of a category”? BW: Not really. We don’t really think about it that way because we’re not likely to—especially if a category is specific—we’re not likely to do it that often again. If someone has a real brainstorm for a category, then just by the nature of it being somewhat unique, we’re not likely to do it again in a hurry. The categories that we do with a fair amount of frequency are things like American history and science. But, Harriet Tubman we’re not going to do multiple times too much. So people write their seven clues and that’s it. AVC: Do you assign different category genres to each writer, or do people pick whatever interests them? BW: People pick whatever interests them. If I have an idea for a category, sometimes I’ll ask someone to write a specific category, but nope, I don’t generally assign. People write what they want to write. Of course, everyone has their areas of interest and areas that they’re better at, but everyone writes everything, pretty much. AVC: Do you have particular areas of knowledge that you prefer to write categories for? BW: I have areas of knowledge—I know literature, sports, a few others—but one of the interesting things is that you’re always trying to write things that are accessible, and if it’s a subject you know a lot about, then there’s a danger of writing things that are too esoteric. Which might happen to me with English literature. But if I’m writing physics then I can be pretty certain: If there’s something I’ve heard of, then most people have heard of it, and so it’s easier to write things that you don’t know about. Because they become more accessible, which is what we’re always going for. AVC: So how do you determine when a piece of trivia is too obscure? BW: There’s no formula for it, really. It’s subjective. That’s our job, and of course we don’t do it individually, we do it communally, and a lot of it is based on your age and we have to struggle with that because there’s not a lot of turnover on our staff. We continue to get older while the contestants get younger, and so we have to be aware that things that happened in the Reagan administration are not second nature to people who were born during the Reagan administration. So we do work on that. Those of us who have kids have a slightly easier time with it, but it’s something we try to work on—staying current. Both because it’s good to be current and hip and because, like I said, we can’t count on contestants who are years younger than we are to have the same base of knowledge that we have. And you don’t want stand-and-stares; that’s the one thing we’re always trying to avoid. AVC: So it’s a collective process. When categories and questions get submitted, when a weeding-out process happens, does this happen in a group meeting with all the writers? BW: Well, initially the writers give me the categories, and so there’s some weeding out and rewriting when I take the category and put it into research. And then a lot more happens at the round table process, and then when our executive producer goes over the games also, or people will say—we have lively debates. “No one will ever get this in a million years, you’re crazy, nobody knows that.” It depends on how old you are, it depends on your life experiences, it depends on what part of the country you’re from. So yeah, it’s something that collectively we try to find a balance, and of course on a regular basis we ask clues that no one gets, so it’s not an exact science, certainly. AVC: How long was it before you became head writer? BW: I was a writer for 15 years—’96 to 2011. AVC: When you became head writer, how did your job change? BW: Well, instead of primarily being responsible for producing categories independently, now I’m primarily responsible for supervising the other writers, supervising the researchers to some extent, and assembling the games. A little more of an executive function. I still do have some time to write categories, but that’s not my main job. AVC: So how do you assemble the game? BW: There’s a fairly basic system of color coding which divides categories into four types: academic, pop culture, word play, and kind of lifestyles, which is everything else. And then you try to assemble them. And assemble them with a certain degree of balance and variety. If you have something old, you try to have something new. If you have a really narrow category, you try to balance that out with something that’s a little more general. It’s tricky. There are a remarkable number of ways that categories can be similar and not belong in the same game, and every time I put games together, its, “Oh, I didn’t realize this one had all people as the response, so we shouldn’t have two of those on the same board,” you know? “I didn’t realize these basically covered the same era, we shouldn’t have those on the same board.” So basically the ideal game is one that has something for everyone. AVC: Are there particular genres of knowledge that you find tend to run up against each other a lot more, that you have more trouble breaking up and separating? BW: No, I wouldn’t say that. There’s types of categories people write. People write “19th century literature” and then they write “19th century history,” and then those don’t go together. They write “C in geography” and “C in science.” Basic things like that. AVC: Would you find that when you were writing categories, that if you did a category like “C in science,” you’d then be inspired to do the next category that day of “C in literature” or “C in books,” or did you not think of it like that? BW: I wouldn’t do it that way, because one of the great things about this job is the variety of it, and so if I wrote “C in science” I would then try and do something as different as I possibly could. I don’t know what the other writers’ process is. But I would—if you write some science, then you have lunch and you want to come back and write movies afterwards. I think one of the fun aspects of the job is the variety that it exposes you to and the variety of your activities. So I would say no. AVC: You mentioned a round table. Is there a set day of the week that happens on? BW: Nope. It happens when—we tape five shows in a day, so we basically approach the games in those units—pools, we call them. So there are five-game pools. And we tape 230 shows in a year, so 46 pools, so 46 round tables. AVC: Okay. So once you’ve got all of the categories for a particular game, then you have the round table for it? BW: Right. Well, you put the games together in groups of five. You put five together at a time, and you do a process we call duping, which is making sure there aren’t, three clues about Cypress in the same five-game pool, and then we do those in a group of five and then you round-table them in a group of five. And then we tape them in a group of five. AVC: So when you’ve got your group of five games, how does a typical round table go? BW: We sit there, and everyone has the games in front of them—they’ve been distributed before. When there was no computer, that wasn’t feasible, and so what we would do is read the games. Everyone would respond to the material for the first time, which kind of had its advantages. But the system we have now has its advantages too, in that people can look at the material before and dig a little deeper and get into some research issues if they need to. So you sit there and say, “Okay, first board, first category, U.S. presidents, does anyone have anything to say?” And someone will say, “We did this Ulysses S. Grant fact last year, we have to get rid of this clue, you have a lot of extraneous verbiage in this clue, this isn’t clear, no one will get this, we should move the three up to the two” and so forth, and then we go on to the next category and you go through like that, and we pick the Daily Doubles, and that’s the round table. AVC: Is there a specific process for picking the Daily Doubles? BW: A Daily Double is supposed to be like a “Final Jeopardy!”—it’s supposed to be something that requires a little more thought, requires a two-step process. That’s the archetypal Daily Double, so we look for clues like that. AVC: And like you said, once it’s come to the round table, you’ve already roughly assembled the games in the order you think they should go—is that right? BW: Yeah. I mean the games are pretty much—a category might get moved [around], but a game is a game. A game is pretty much going to stay together. Those 12 categories, 13 categories counting the final, are pretty much going to stay together until the show is taped. AVC: So do you prefer when you get to create a distinctly new category when you’re working, or is it preferable to have variants on those you’ve used lots of times before? BW: I think we’re always looking for something new. We try to cover as much ground as we can, and I’m sort of haunted by the idea that there are vast areas of knowledge that, because they are not crossing my desk or not crossing my mind, we’re just not doing. So we’re always trying to look for new things. New things coming into the culture or new ways to approach the traditional body of knowledge that we deal with. AVC: How many questions get thrown out upon review? BW: Well, in every category one is going to get thrown out, and then there’s always an extra there for emergencies or technical problems. And so two clues out of every seven get thrown out, but they could get used later if you write that same category again or you really like that clue and you want to write around it. So a lot of clues get thrown out, but some of them come back again. But we have thousands and thousands and thousands of unused clues, and most of them will never see the light of day. AVC: Have you ever had one thrown out and you say, okay, I’m going to create a new category for this because I like this piece of information so much? BW: Oh, sure. All the time. AVC: Can you think of an example? BW: I’ll tell you my favorite clue that I’ve—almost my favorite clue that I’ve ever written, and I can tell you because our head writer, our executive producer, won’t use it because he didn’t like it. Let me see… [Looks it up on his computer.] “Gene Siskel said he often got these as gifts to help in his particular line of work. He never used them.” And [the answer is] “What are lighted pens?” I just love that clue. Because you can think, “What did Gene Siskel do, and what would someone give a film critic that they think he could use…” Anyway. I’ve stopped now, because I put it in about three different categories and Harry Friedman, who is the executive producer, didn’t use it. He threw it out every time. So I think I’ve given up on that one, so I give it to you. AVC: Well, thank you very much, I appreciate that. And now it will live forever in this interview. BW: There you go. I did an end run. AVC: Exactly. Okay, so once you’ve got this—you’ve done your round tables, your games are all set to go, what does your work consist of for taping days? BW: On tape days you have your group of five games that were assembled, but there’s a randomization process to help with fairness. So there are those five games, plus one other game that was left over from a previous day. So this outside company, they call us at 7:30 in the morning, we give them six numbers, and they pick the game numbers, because all the games are numbered, and they pick the five that we’re going to do that day and tell us what order they’re in. Then Alex [Trebek] gets the games—he comes in at 7:30—gets his five games, and everyone else—our executive producer, one of our other producers, myself, the outside person from Compliance And Practices, one of the other writers, a couple of the other writers actually—we sit around and have a production meeting, which is basically for Alex to raise any of his concerns, because he hasn’t seen the material before, and there are issues that come up on tape day—we have video clues, sometimes those have clearance issues. Sometimes things at the last minute have to be pulled, sometimes since that five-game pool got jostled by the extra game going into it, sometimes there become conflicts of material, where you’ll have two clues about the same person, which you don’t want in one week, so those have to be fixed. So that’s the production meeting. BW: He gets here earlier than that, but he gets the games at 7:30 because that’s when the choice is made. AVC: Right. And what time is your production meeting at, then? AVC: So he’s got about an hour and a half to look through them prior to meeting with you guys. AVC: Is he fairly hands-on when it comes to these? What are the concerns he might raise about a particular category or game? BW: He raises concerns where he doesn’t think anyone will get the answer; he raises concerns about clues being worded in an unclear way, or a convoluted way for the language to be put together, that makes it hard for him to present it clearly. He points out things that are not accurate to his mind, or that the usage of a certain word is wrong. 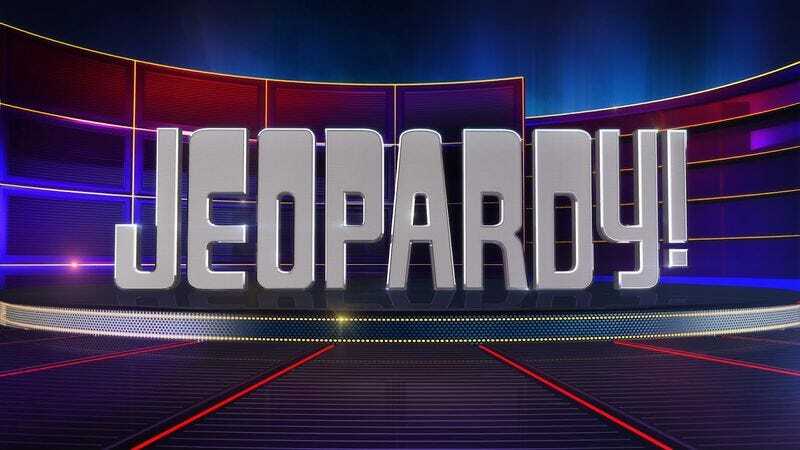 Occasionally, really very occasionally, there’s a topic—we don’t push the envelope that much on Jeopardy!, but occasionally there’s a subject he doesn’t feel comfortable with or he doesn’t feel is Jeopardy! friendly. And we help him with—obviously he’s very good with languages, but if it’s Finnish or something like that, we’ll get the pronunciations for him. I would say those are his main areas of concern. AVC: So are there certain categories or topic ideas that you have learned are off-limits over the years, because you know he’s going to say, “Well, this isn’t really Jeopardy! friendly material”? BW: We don’t get into anything raunchy. That’s basically it. I’m trying to think what else Alex doesn’t care for. He pretty much trusts us at this point—hopefully he does—and of course we count on him, so… no, he doesn’t really take a machete to the games very often. AVC: So then after you’ve had your production meeting, what happens next? BW: We make the relevant changes and then we go into the studio and we tape five shows. AVC: What do you usually do while the game is being played? BW: I’m on stage with the producers and a couple of the other writers, and we’re sitting there, watching. Listening, first and foremost, for responses that they give that we didn’t expect that turn out to be correct. Judging their responses. Sometimes there are issues of pronunciation, sometimes technical problems come up and the wrong clue gets revealed or something… that doesn’t happen very often, but things have to be replaced. Just things that can go on during the taping of the show. But basically things happen in real time—we tape a half-hour show in half an hour. AVC: So during a show when Alex refers to the judges, he’s actually referring to you? BW: Me and other people, yeah. Harry Friedman, who’s our executive producer, Rocky Schmidt, who’s one of our senior producers, and Michele Loud, who is another of the writers, yeah, I guess we’re the judges. AVC: Do you guys have a list in front of you of possible answers that will be considered correct? What are the main things you’re looking for in terms of answers? BW: Well it’s a script, and there’s a response, and it will say “accept” under it if there are things that need to be accepted. But Alex has that, too, so he knows to do that. And there are… sometimes it says “do not accept” if there’s something that seems like a plausible response that we’ve thought of but we know is not right. But sometimes things come out of the blue and we just say, well, we never thought of that. We’ve never heard of it before, or sometimes the contestant reads the clue in a way that we hadn’t thought of, and then you have to consider, well, if you could possibly interpret that clue that way, then maybe the response is correct. AVC: So sometimes a contestant will give a response and Alex will say no to it, but while he’s doing that the game goes on and someone will quickly be looking that up because it will strike them as a possible “we hadn’t considered that”? BW: Exactly. I mean, our whole research and writing staff is in a building a hundred yards away, watching everything on the monitor and frantically Googling what they say if it’s something we didn’t expect. I mean, we check everything. Unless the clue is, “Who was president in 1950?” and they say “Abraham Lincoln,” we pretty much check everything to be sure. AVC: I wanted to ask briefly about the clues read by the traveling staff. AVC: Yeah, The Clue Crew. How do you get them the clues and categories? How does that work? BW: The locations are chosen by our producers, and there are various considerations. Obviously the primary one being, what would be the most interesting material with the most interesting visuals? There are also some promotional considerations that come up. Then a writer is assigned to write the clues, and he or she will research that topic, call the museum or the battleship or whatever it happens to be, if that’s the case, and write those clues up. And you’ll go through a different process with another of our producers, Lisa Broffman, and Brett Schneider who’s our field producer for most of those shoots, and we also do Clue Crew clues in the studio, where they’re kind of demonstrating things. AVC: Yeah. I’ve noticed sometimes an entire category will be a Clue Crew member at a particular location, but other times they will be broken up through other categories. BW: Right. So what happens is you send them to a location and then the first category you’re going to do is Monticello. But then you might have a clue left over, so you put one of those Monticello clues somewhere else. And then some locations don’t seem to lend themselves to a category, but they produce interesting clues… the location seems to maybe not be familiar enough to people to belong to an entire category by itself, but you can scatter the clues. AVC: So in those cases do you have a list of singular clues that you ask the writers to figure out a way to work into a category? BW: Yeah. That’s exactly what we do. If it’s a national lab, we say use this in a science category. If it’s a president’s home, you say put this in a president’s category. AVC: And I assume all this is stored in a computer document or something, so everybody has access to these things that need to be slotted in somewhere and they can grab them as they’re working throughout the day? BW: Yes, exactly. It’s a database that all the writers and researchers have access to and we all work off it during the day. AVC: Okay. So how do you handle the different competitions? Like what changes in your job for the Teachers Tournament versus the Celebrity Tournament and so on? BW: Every tournament is different. I would say, running them down, while the Teachers Tournament we try to put a few teacher-friendly, education-type categories in there, that the material is really not all that different. The people at our Teachers Tournament are not really all that different from our regular contestant pool. In the Tournament Of Champions, it’s tempting—there’s always clues that you—we’re always dealing with these issues of repetition, and so it’s nice to have a little freedom to write tougher stuff, because then you can do a wider variety of clues. But our Tournament Of Champions contestants are not superhuman—they’re above-average contestants, or they’re regular contestants who had a good run, so you have to rein yourself in a little bit and not get too esoteric. And then the teen and college and kids’ weeks, you have to take into account how old they are and what their knowledge base is likely to be. AVC: Thinking back to the first time you had to do those tournaments as a writer, did you find a steep learning curve, in terms of the previous head writer telling you, “No, no, you have to start thinking differently for these categories”? BW: You have to feel—you definitely have to feel your way, absolutely. And there are tricks to it. One of the things Alex Trebek often points out is that for teen and college students, they know history, the stuff you learn in history books, and obviously the stuff that’s going on right now. But the kinds of things that were in the newspaper 10 years ago, 20 years ago, they might be sort of historical but they’re part of your life experience if you lived through that, you can’t assume that they know that stuff. So there tends to be a big chunk of time between the Bay Of Pigs and ISIS that they might not know. And you have to take that into account when you’re writing for younger people. AVC: Are there any other specific tricks that are always in the forefront of your mind when you’re doing a specific tournament? BW: Well, it’s kind of fun for—if we’re doing college, I’ll sit there and write [clues about] video games, and you try to familiarize yourself with what the hot video games are. So it’s fun to write a clue, and you had never heard of this thing from two years ago in your life, and you say, what the heck, 10 million people have bought it, let’s try it, and you ask it in the College Tournament and the college student answers it like it was his own name. It’s fun to familiarize yourself with that stuff. And sometimes, of course, they’re as bewildered as we would be. But you try to get yourself into the world of someone that age as much as you can. AVC: How does the Tournament Of Champions differ? Because presumably these are all people who have specific experience with certain categories. Do you have to go out of your way to try and make sure you’re not doing the same categories from their previous victory games? BW: We always check that we’re not repeating material within a two- to three-year basis, so theoretically there shouldn’t be anything like that, that they got before. If there’s something really specific, then it tends to stick in your mind enough that you wouldn’t do it again that soon, anyway, so the normal process of checking should take care of them not being asked the same thing. AVC: But surely there’ve been a couple champions that clearly stood out, that were masters of physics, or sports, or something. BW: Yeah, we try really hard not to take that into account. For one thing, it’s still only one category out of 12, or 13 if you count the final. You’re not going to win the game because you did well in one category. And then we try not to really be—of course in the Tournament Of Champions we basically know who they are, but we try not to be cognizant of the contestants, and their strengths and weaknesses. Because it’s equally unfair to write to someone’s strengths as to write away from them. So we try to be contestant-neutral as much as possible when we’re writing the show. AVC: That makes sense. Are there things on taping day that contestants will do during a game that annoy you? BW: [Laughs.] No. Any contestant who can play the material is fine by me. And they can do almost anything, as far as I’m concerned. If they’re answering the clues, then they’d have to really go a long, long way to annoy me. So I would say no. You did that interview with [Jeopardy! champion] Arthur Chu—he was talking about preparation, and I think that he was saying, “Why wouldn’t you prepare for this opportunity?” And I think that surprises me occasionally, about contestants who don’t seem to have done basic preparation. I mean, you can win $45,000 in an afternoon—why wouldn’t you want to give yourself the best chance to do that? But, you know, it’s not my job to tell them what to do. AVC: True. But are there any winners who surprise you with a win because it seemed like they weren’t prepared? BW: Sure. But I don’t handicap the games. In every game there’s going to be a winner, and sometimes it’s just their categories. We try to cover as much of the range of knowledge as we can, but sometimes a contestant will luck into stuff they happen to know in one game, and then they’ll be gone the next game. So that certainly happens. AVC: Do you have any ones that stand out for you? Or an anecdote or anecdotes of some of the most memorable things that have happened during a taping? BW: Wow… things that have happened during the taping… sorry, you know what? I can’t think of anything off the top of my head. We’ve had our share of hair-on-fire moments, certainly, but nothing comes to mind, really. It’s generally fairly—I was going to say something that would jinx us, so I’m not going to say it. AVC: That’s fair enough. Have you ever had to pause taping because suddenly a contestant gets sick or something? BW: Yes, we’ve had people… they don’t have that much lead time to know that they’re going to be on national television, so, occasionally people will try and starve themselves I guess, to lose a few pounds. It’s tough up there, and as writers we try to be aware of that. So we try not to say, how could you not know that? How could you make that absurd Daily Double wager? It’s tough. They’re up there, there are hot lights, they’ve never done this before except for the rehearsal they get on tape day. It’s a tough moment for them. And so now I forgot your question. AVC: You’ve had to pause taping because somebody fainted or that kind of thing? BW: Yes, that has happened—once in a while. It’s stressful. Sometimes it’s stressful for them, and sometimes, that stress is too much for them. Once every three or four years it happens—that someone needs a little help. I don’t think we’ve ever had anyone go away in an ambulance, though. AVC: It’s more they get a little green around the gills and need a glass of water or something? BW: Yeah. They have to sit down, have some smelling salts or something. AVC: Okay, so what’s your yearly schedule? Do you have a set time that everybody’s off? BW: Yeah, we tape Tuesdays and Wednesdays, two or three weeks on, one week off, and that lasts from like August to April, basically. And then May, June, and July, roughly, are a hiatus from taping, and that’s when people take their longer vacations, but that’s also the time you use to stockpile material and put more games together, because you’re not interrupted by two production days a week. And that’s basically it. AVC: What’s your favorite part of the gig? BW: I think the variety is the best part. There are a lot of aspects that are really fun… sitting and having time to write a category, sitting at your desk with books piled around you and five windows open on your computer is fun, and then production days are fun. Getting to see the whole thing come to life and seeing how the whole thing actually plays. It’s a job that has a lot of variety to it, and like I said, I was always a trivia-oriented person, so it’s been very lucky for me to find a job that taps into that. AVC: Let’s say you hired a brand-new writer, starting tomorrow. Is there a specific piece of advice that you would give them, as far as writing for the show, that you wish you had known when you first started? BW: I mean, I think that I would say it’s just common sense—try to think of everything as material. The kind of person that becomes a quiz show writer is like this anyway, but be curious and keep your eyes and ears open, and if we’re going to have the kind of range of knowledge on the show, then I think it’s great for people to see everything in their lives as material, and not get hung up on, “Is this a Jeopardy! question?” but think of bringing your life experience into the gig as much as you can. AVC: Unless of course your life experience is way too obscure for a particular question. BW: Exactly, yeah. Don’t bring too much of it in. Your life experience that you can reasonably assume is common to other people. Bring that in. AVC: So maybe not that great Pearl Jam concert you saw in 2003 or something. BW: Right, exactly. Especially if you’ve been following them around the country for years, then don’t focus on that.